FREE Beginning Sounds Activity for Preschool & Kindergarten! Have you seen my Read ‘n Stick mats yet? They’ve been a great tool for helping my older preschooler learn to sound out words in word families. His younger brother wants very much to do those himself. In fact he’ll take the cards off the mat and ask me to help him put them in the right places- even though he doesn’t sound out words yet or understand much of the vocabulary. My Three isn’t ready to learn to sound out words; he needs to work at hearing beginning sounds. So I decided to create him his own stick mats. He loves these and asks to do them. I love that once they’re assembled, it’s easy to take out the binder and let him work at the kitchen table while I’m preparing a meal. And the Velcro dots keep everything in one place. I hope you can use this beginning sounds activity in your home or classroom! I call these Beginning Sound Match Mats. (Sorry for the tongue twister at the end there.) Each mat builds on the previous one – so while the first mat only requires your child to match pictures beginning with f and t, the next mat adds a new letter – and so on. 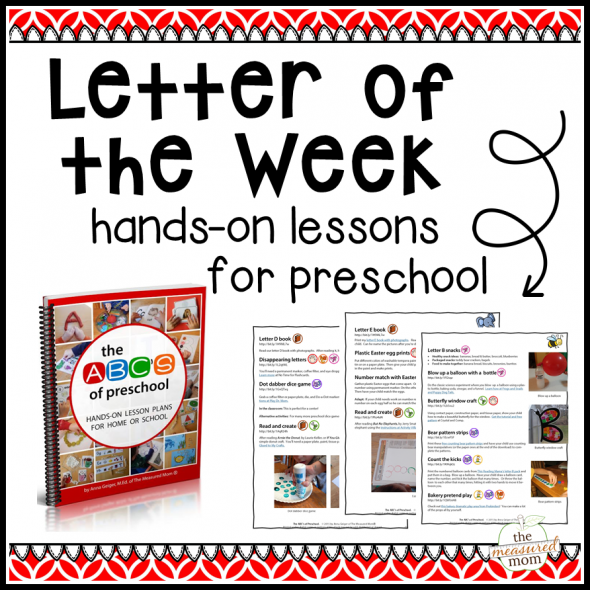 The newest letter always receives the most attention, and as your child has had several mats of practice with a particular letter’s sound, that one gets bumped off to make room for another letter. What order am I using? Since I use pieces of Reading the Alphabet to teach my boys to read, I’ve decided to use that curriculum’s order of teaching the letter sounds. You could go in whatever order you wanted, but if you want to make this a learning experience that builds on previous mats, start with number 1. 1. Print the mat and the cards. 3. Cut apart the cards. 4. Attach clear Velcro dots to the pictures and cards (you’ll use the fuzzy white part on the back of the cards). 5. Punch holes in the mats and store them in a 3-ring binder if you want to keep them all in one place. 1. Have your child take off all the cards (no problem there – my Three does not want any help because he loves those Velcro dots!). 2. Guide your child to say each picture name, listen to its beginning sound, and find the letter which makes that sound. Attach to the picture. 3. If your child wants to do it a different way, see if it works for him. My Three likes to take the letter cards and move around the board, saying each picture and finding the one that matches. It seems less efficient to me, but he’s resistant to my way of doing it. He actually gets more practice this way! 4. Take out the mats as often as your child wants to do them. 5. 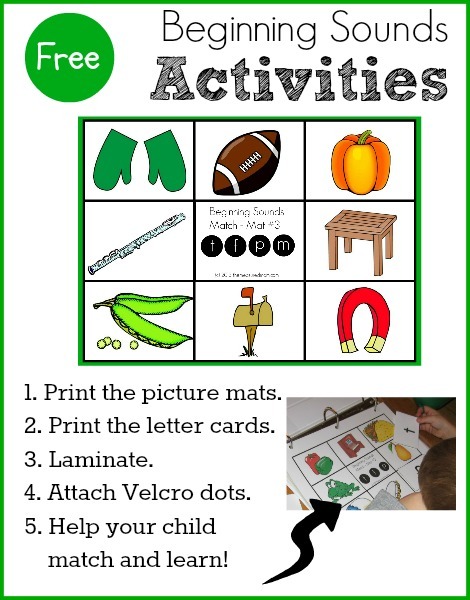 Find lots of other fun ways to practice beginning sounds to supplement this activity. Follow my Alphabet for Kids Pinterest board for ideas – I’m always adding new ones! I just printed these as I think my one would love this type of activity! Thank you for all your hardwork putting these together. You’re very welcome, Kristen! I am working on another set which I will be sharing within the month, I hope. These are amazing! I think I could spend hours downloading and creating from your site. Thank you. Oh, please do! 🙂 I’m glad you’re finding things you can use, Angie! Thank you! My 3 1/2 year old is just now starting to sound out the letters that he sees. This will be a great, orgainized way to help him build this skill. I am also following Reading the Alphabet (thanks to reading about it here on your blog) and this will be the perfect addition! Thanks again! I’m so glad these will work for you, Deborah, and am very happy to hear that you’re using Reading the Alphabet. Stay tuned- I’m working on another set. You are very welcome, Veens! I really appreciate your comment! Perfect resource for homeschool families! thanx for sharing. I think I will use these for bingo games for my kiddos. Thank you for posting this! We are going to do it in small groups this week. My entire class needs work on beginning sounds. I’m so glad you can use it, Amanda! Can I ask what you teach? Preschool, we did two of them today, going to rotate through the rest on Wednesday and Friday. The kids enjoyed it and they are starting to catch on. Thank you again! Thank you soooo much!! I really appreciate the help from a grade one teacher and a single mom. You’re very welcome, Lynn! I hope you find a lot of things here you can use in your classroom and at home. I remember how tiring it was to be a full time teacher, and parenting can be pretty exhausting too. 😉 I hope what you find here can save you a little time and effort. Have a great week! Thank you soooo much. This will save me tons of time. I appreciate your sharing with us. Can’t wait to see more. I like many of these game ideas on your site. I’ve been looking for these types of ideas to make games in Spanish for home use. Hopefully you’re finding some good inspiration for making your own materials! Thanks so much for stopping by, Renai. Thank you so much for providing this fabulous resource. I am truly grateful, as I am new to elementary age children. It is great to see such creative work. You are very generous to share this with others. Make sure you right click on the download link and save to your computer – then open. If none of the options are working, let me know what’s happening – if you’re getting an error message, nothing is hapepning, etc. You are the answer to my prayers with these creative activities. I just printed these as I think kids would love this type of activity! Thank you for all your hardwork putting these together. I’m so glad you can use them, Dayen! All of your activities are AWESOME for Kindergarten!!! I’m glad you like them, Dawn! I’m so glad you like them, Melania! Our 6 year old is having trouble hearing the first sound on words. This will help us. I have some from when he was 4 that you helped us out with. Any other way to help him with the sounds that he is missing? He is above average in reading for Kindergarten but we a stumped on how to help him out. Is he having trouble isolating beginning sounds or telling you what letter actually makes the sound?